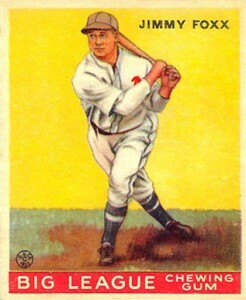 Jimmie Foxx was one of the most prolific hitters the game has ever seen. With the ability to hit for power and average, his prowess at the plate wreaked fear in opposing pitchers. 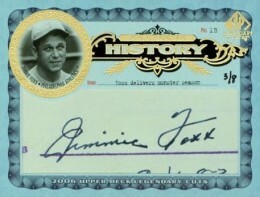 As a result, Jimmie Foxx baseball cards and autographed memorabilia are highly coveted, even to this day. Foxx spent the majority of career split between two rabid fan bases, the Philadelphia Athletics and the Boston Red Sox. Competing for his collectibles are not only collectors of those two teams, but 500 Home Run Club collectors, Hall of Fame Collectors, just to name a few. What results is frantic bidding on any high-grade card, game-used memorabilia, or authentic autographs that hit the market. With regards to Foxx's modern cards, his first certified autograph cards were one-of-one cut signature cards in 1999 SP Signature and 1999 Upper Deck Century Legends. 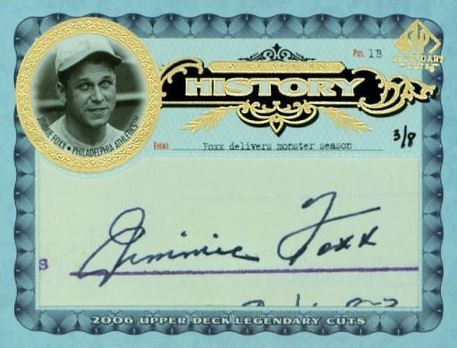 That year also saw the first Jimmie Foxx memorabilia card, with Upper Deck producing a bat card for the Piece of History 500 Home Run Club set. The bright yellow background and accompanying red banner along the bottom provides a striking contrast to the image of Foxx, clad in white as he swings threw a pitch in a posed shot. This is identical to card #29 but with different numbering. Neither card commands a premium over the other but this one seems easier to find. 2016 PANTHEON BASEBALL DUAL GU BATS RELICS GOLD JOE DiMAGGIO & JIMMIE FOXX 3 5! When looking to purchase authentic autographed memorabilia from legendary and long deceased players like Jimmie Foxx, great caution is urged. We recommend buying authenticated Jimmie Foxx signature autographs from one of the reputable authenticators in the industry, PSA or JSA. 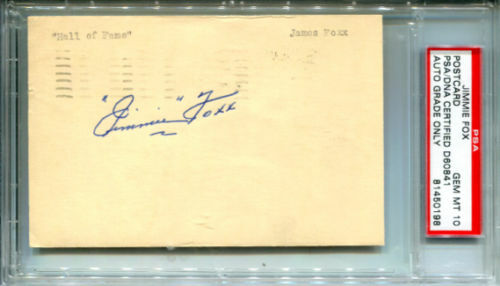 The most common items found to be authentically signed by Jimmie Foxx include index cards, letters and photographs. Any cut signature trading cards from manufactures like Topps, Leaf, Tristar and Upper Deck should also be considered legitimate. A classic cursive script makes each letter identifiable. The "J" resembles a backwards "B." The "i"'s are dotted but haphazardly. The "m"'s are nearly identical as are the "x"s.
The "F" looks like a "7" overlapped with a triangle with one line considerably longer than the other. An underline of some sort is often present. My sister in law came across a Jimmie Foxx baseball card from her late husbands things. wonder if it has any value. National Baseball Hall of Fame 50 years model.Also Mike Schmidt 2001 Collection. Advise. ? ?